Berlin was an absolute blast, it must be said. From a bizarre bar that squirts you with a jet of water as you enter to the astonishing Daniel Libeskind-designed Jewish Museum, I’d forgotten quite what an amazing city Berlin is. In addition I managed to make a couple of minor literary pilgrimages, first to the hotel where P.G. Wodehouse spent much of the war, and also to the site of the cafe where another hero of mine Rupert Brooke wrote ‘The Old Vicarage, Grantchester’ (“Stands the church clock at ten to three, and is there honey still for tea?”). If you ask me the original building was better than the monstrosity that’s there now. 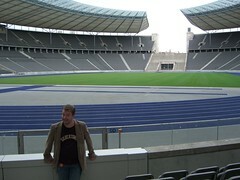 Oh, and here I am at the Olympic Stadium , where Jesse Owens gave the royal metaphorical finger to Hitler by winning a sackful of gold medals in 1936, and where Zinedine Zidane nutted Marco Materazzi presumably because he didn’t like there being two players on the field whose first name and surname began with the same letter last month. In other news, I’m off filming in the US next month, the Elvis book editing process is creaking along at glacial pace (mainly because I’m crap) and I’m putting the finishing touches to the proposal for the next book and a couple of winning (ha!) television ideas. Ooh, I nearly forgot. Whilst in Berlin I stumbled across a frankly maginificent Russian klezmer band. Now, klezmer is a favourite music of mine, and this lot were quite brilliant exponents of its foot-tapping art. Imagne my delight then when I rolled up at Klezfest in Regent’s Park on Sunday to find them performing. Marvellous.